Cantata Singers is a Boston-based chorus and orchestra inspired by the musical genius of Johann Sebastian Bach. Our concerts explore relationships in music from the 17th century to today and invite exploration of Bach’s profound and continuing influence on our music, our culture, and ourselves. Our education program teaches songwriting and choral singing to under-served Boston schoolchildren, guided by the belief that all children deserve the means to express their creative voices. A singular desire to bring music to Boston’s listeners that isn’t being heard anywhere else has inspired Cantata Singers’ programming for 55 years. In 1964, that music included the cantatas of J.S. Bach. When Cantata Singers was founded, live performances of Bach cantatas were quite a rarity. In fact, Cantata Singers’ early concerts featured first Boston performances of many of the cantatas. 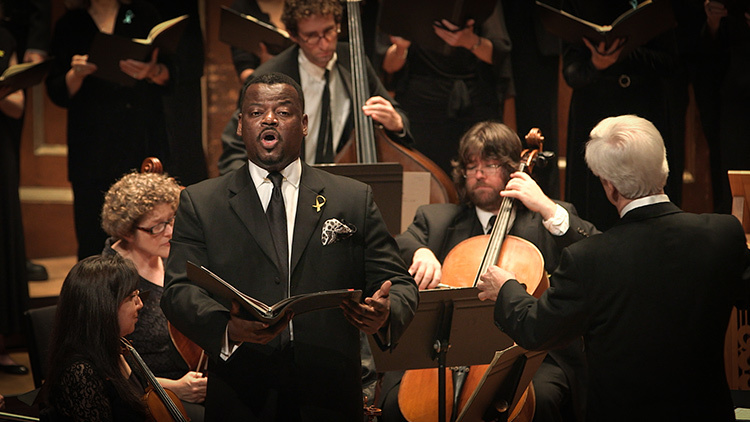 Bach’s music, from the cantatas to the Passions, remains an essential part of Cantata Singers’ repertoire. However, the ensemble’s repertoire has expanded to include music from the 17th century to today. Cantata Singers has commissioned 15 works for choir and orchestra—including one that was awarded the Pulitzer Prize in Music—and has presented more than fifty Boston premieres of music both old and new. Many of Boston’s most talented musicians perform regularly with Cantata Singers. The chorus is made up of singers who have careers as musicians, educators, doctors, and architects. Many appear as soloists with Cantata Singers, as well as with other highly respected organizations; some conduct other choruses and orchestras. Although many of our musicians perform actively as solo singers, they choose to sing with Cantata Singers because of the reward they find in performing music of the choral canon at the highest possible level.